"Sometimes the wrong side of the law is the right place to be." 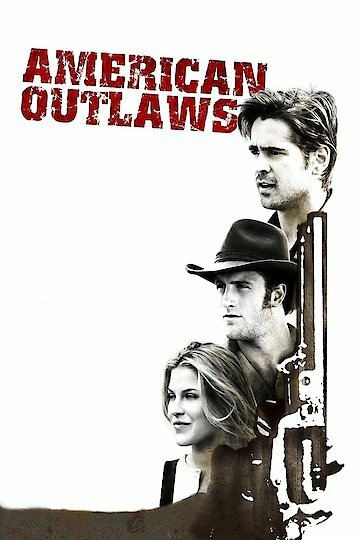 American Outlaws is a historical western crime drama that was written by Roderick Taylor and John Rogers. Directed by Les Mayfield, the film features Gabriel Macht, Scott Caan, Collin Farrell and Ali Larter. The story follows the exploits of the notorious James and Younger brothers around the time of the civil war. The James brothers and war buddies, the Youngers are celebrating about their bank robbing conquests. Then they learn that the the army led by General Lee has pulled out, so the war has ended. The gangs decide to return home to their farms and families. Things in Missouri have changed a great deal upon their return. The Yankee army has taken over the town. Jesse's friend, Zee (played by Ali Larter) has grown into an attractive woman. A man is hanged in the town square for treason. The farmers with a lot of land are being pressured by the railroad company to sell. When they don’t do so, their farms are burned down to the ground. Frank James learns that the railroad really does not need the land - they only want to get it cheap so they can resell it. The gangs do not want to sell their land and when approached, Cole Younger (played by Scott Caan) kills two of the men who try to strong arm them. The army is set to hang Cole but his brothers and the James gang decide to save him. During the rescue, Jesse James is shot in his shoulder so he hides out at Zee's farm to recuperate. Jesse and Zee attempt to start new lives, but the Pinkerton men find and arrest Jesse. While on the way to jail, Jesse escapes, though chained in a train car. Zee and the rest of the gang shoot a cannon, stopping the locomotive to rescue Jesse. When confronted by Pinkerton and Rains, Frank chooses to shoot a prized watch that Rains got from his father, rather than the men themselves.